Ginger Jentzen, former executive director of 15 Now Minnesota, speaks at a Sept. 29 press conference at City Hall introducing a growing coalition of the Fight for $15 movement. Photo by Cristeta Boarini. Paul Wellstone’s famous two-cents on effecting lasting change seems to be as à propos as ever, right here, right now, in Minnesota. That’s because Minneapolis is currently experiencing one of the largest grassroots metamorphoses in its history. The work is happening under the glow of street lights, inside cozy church basements, and in the break rooms of mega stores like Macy’s and McDonald’s, where thousands of Minneapolis workers and citizens are transforming the city to fulfill their vision of ending poverty wages. In less than two years, the Fight for $15 movement has already drastically altered the political landscape in Minneapolis and won over the hearts and minds of the city of Minneapolis, with over 68 percent of residents asserting their unwavering support of a $15 minimum wage ordinance for all workers by 2022. There is a strong conviction within the movement that this is a fight workers can win. So, through their determined and strategic organizing, the Fight for $15 coalition has recalibrated and are determined to make the $15 per hour minimum wage, as well as fair scheduling, and earned safe and sick time, a reality in the Twin Cities. “These are really wild, inspiring times. 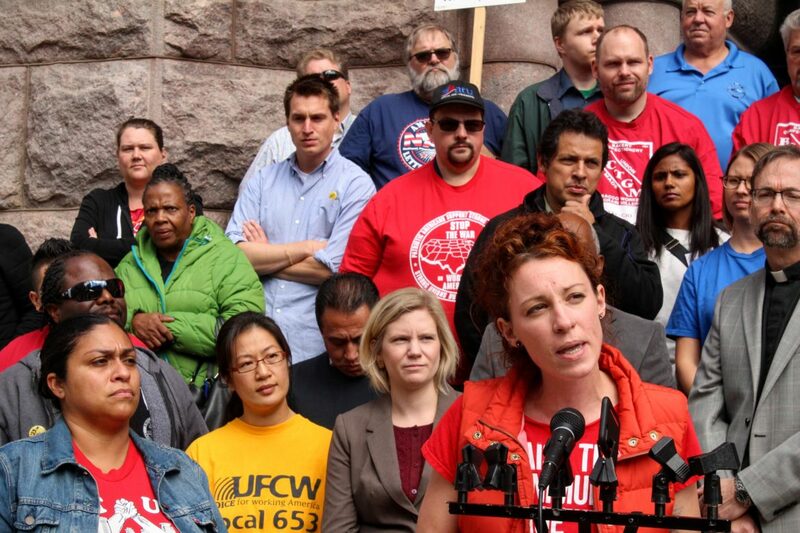 We’re building up movements that actually win victories,“ said Ginger Jentzen, executive director of 15 Now Minnesota. On Sept. 29, a coalition for the Fight for $15 – made up of Socialist Alternative, Neighborhoods Organizing for Change (NOC), Centro de Trabajadores Unidos en Lucha (CTUL) and 15 Now Minnesota – held a press conference in downtown Minneapolis outside of City Hall. There, they announced the broadening of their coalition to include unions, labor groups, and local faith organizations, all uniting under the banner of fighting for a living wage and economic justice. Some familiar faces, among them well-respected and established groups, have shown up to publicly endorse the campaign. SEIU Local 26, which represents over 6,000 janitors, security officers and window cleaners, as well as AFL-CIO’s local affiliate, the Minneapolis Regional Labor Federation; officially endorsed the campaign, and pledged to use its collective power to help organize workers at the city level. ISAIAH, a coalition of over 100 faith-based communities in the Twin Cities, has also joined forces, continuing to implement their impressive direct engagement and door-knocking strategies to garner widespread public support. Rupa Ryan Kryzer, an associate organizer with ISAIAH, explained that the real victories are claimed when the power of the people organized and mobilized outweighs any monetary influence that big business or other Goliath may have over the political process. The broadening of the coalition is essential in order to create enough passionate, widespread community support so that local governments will have no choice but to pass a living wage ordinance. “This is definitely where we are going to build our power, by encouraging each person to look deep within themselves and see what they can do,” Ryan Kryzer said. Mike Griffin, Field Director for NOC, explains that much like their own organization, the Fight for $15 movement has gained such extraordinary success because of their horizontal, empowering strategies: that of building power among workers, their emphasis on direct engagement with the community, and gaining from the strength found within under-resourced communities and communities of color across the Twin Cities. “I have total confidence that we will win. Door-by-door, house-by-house, block-by-block, ward-by-ward. We’re going out every day with full time organizers in every ward throughout Minneapolis,” Griffin explained. Throughout the past nine months, the Fight for $15 movement collected 20,000 signatures of residents – a result of its hearty canvassing and public engagement outreach – supporting a charter, or ballot, initiative as a means of passing a living wage increase. Organizers then brought the results in front of the Minneapolis City Council. But even in the face of such sweeping public support and a collective moral urgency, the DFL-led City Council and Mayor’s office spent the summer digging its heels in. According to local organizers, the Council spent considerable amounts of energy mumbling back and forth garden-variety excuses for postponing the ordinance, and even appealed the legitimacy of the ballot initiative to the conservative Minnesota Supreme Court. And, if only for now, the city government scored an insignificant victory against the workers of Minneapolis. In August, the Minnesota State Supreme Court sided with the the usual suspects that make up the DFL-led City Council, Mayor Betsy Hodge’s Office, and the Chamber of Commerce, effectively blocking 15 Now’s attempt to put forth a charter initiative on the ballot this coming November. Within the City Council, Councilmembers Alondra Cano and Cam Gordon are currently the council’s only unabashed supporters of the Fight for $15 movement. Now, it is legally in the hands of the Minneapolis City Council to draft a living wage ordinance. But the folks in the Fight for $15 coalition remain unfazed. And as recently as this week, there are encouraging indications that the City Council is beginning to see the urgency of the moment in passing a livable wage. On Oct. 5, the City Council released results of a study conducted by the Roy Wilkins Center for Human Relations and Social Justice, which shows how a $15 per hour wage increase in Minneapolis would overwhelmingly produce positive outcomes, contribute to greater racial economic equity, and benefit a whopping 71,000 Minnesota workers. Even higher-wage workers will be affected by the positive ripple effects of the increased quality of life for low wage workers, the study revealed. Minneapolis City Council member Jacob Frey opposed charter referendum but says he is eager to see the $15 minimum wage through to a City Council vote, even if it means delaying the process until next year. The tone that Frey echoes, however, reflects a general sentiment within the city government that many organizers and activists claim just isn’t good enough. The City Council has, for now, essentially tabled the $15 per hour wage issue until 2017, which also conveniently is as an election year. “(Our) staff will be presenting the study, will be conducting engagement and outreach, and then crafting a functional policy that we can vote on by the second quarter of next year,” Frey explained. Further, a wealth of recent and not-so-recent studies have all confirmed that increases in minimum wages never produce those doomsday scenarios that big business boogeymen like to warn people of: the massive layoffs, a sluggish economy, and higher prices, to name a few. Make no mistake, the movement is evolving, adapting and recalibrating its strategy quickly and much to the bemusement of legislative and bureaucratic naysayers. The Twin Cities is often hailed as a national gold standard of best cities to live in the United States. Minnesota is home to seventeen Fortune 500 companies – the highest concentration in the country – yet also the worst racial inequities in the nation. People of color fare much worse in the areas of home ownership, employment and hourly wages. Women and people of color are disproportionately affected. Passing the $15 wage would go a long way to shift the balance of economic opportunity for over 100,000 Minneapolis workers, and it would put almost a billion dollars back into pockets of low-wage workers each year. Blanca Gonzalez (center) is a fast-food worker and organizer with CTUL. 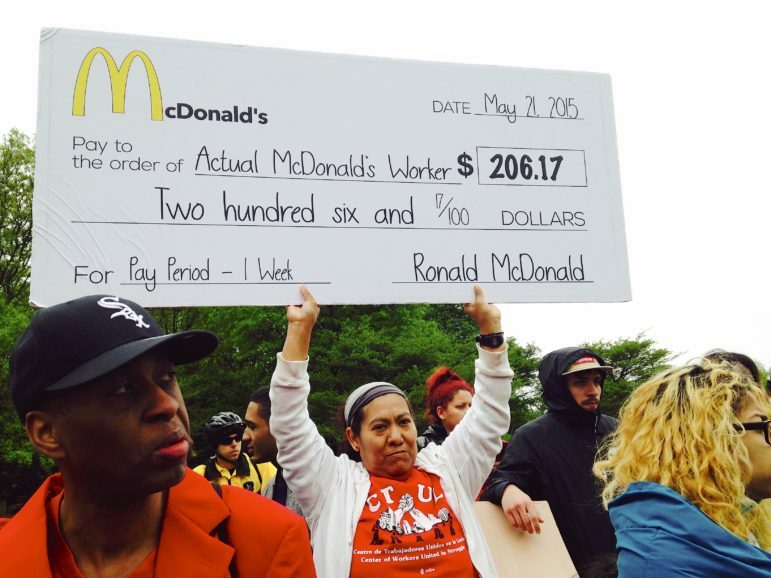 Here, she is pictured protesting at McDonald’s headquarters in Oak Brook, Ill. Photo by Taylor Shevey. Blanca Gonzalez, an organizer for CTUL and McDonald’s fast food worker, has become a beacon of momentum and courage within the local movement, especially among women and non-native English speaking-workers. Gonzalez is a mother of three and Minneapolis resident originally from Mexico who works at the Hiawatha corridor McDonald’s. On Dec. 4, 2014, she participated in her first strike – the second fast food workers’ strike ever in Minneapolis. “At first I was a little scared. I didn’t know how my boss would react,” Gonzalez said in Spanish. But Gonzalez’s bravery persisted, and she went on another one-day strike, and then a two-day strike, where she travelled to Oak Brook, Illinois on May 21, 2015. There, she joined thousands of workers from across the country as they marched to the gates of McDonald’s headquarters during their shareholder’s meeting, 1.4 million signatures in hand, demanding that they do the right thing and raise their workers’ wages to $15. Gonzalez even brought her three children with her to the gathering. “I saw fast food workers from other states fighting for the same rights. I saw that we weren’t alone,” Gonzalez said. She has participated in two more strikes since, one culminating in the city announcing that they will start a Workplace Partnership Group to create a sick days policy. Then, in December 2015, Blanca received an unlikely call from her boss, telling her that she would receive a paid vacation that year. “So my family and I went to the Wisconsin Dells!” she exclaimed. Gonzalez has no plans to stop organizing and striking until the people’s needs and desires are achieved. She’s well aware of what is at stake if our community can’t get there. In 2014, the city of Seattle solidified itself as a trailblazer in the national fight for a $15 per hour living wage as it became the first major U.S. city to pass the ordinance. Minneapolis stands to follow right in Seattle’s footsteps, if, according to Jess Spear, the city is able to recognize and address the barriers in its way. Spear is the former organizing director for 15 NOW in Seattle, and was one of the key players in helping pass a $15 per hour wage increase for Seattle in 2014. “Seattle really kicked open the door and made it clear to workers across the country that if you fight, you can win. But it’s also important to learn the lessons of Seattle,” Spear asserted. “Here in Seattle, the key ingredient was the electing of a Socialist City Council member (Kshama Sawant). She is a Council member that took no money from big business, and she was not a member of the Democratic Party,” said Spear. She argues that in an age where both major parties abandon the wishes of their constituents and eat right out of the palms of big business, electing grassroots party candidates give communities the best chance of creating meaningful change at the local level. “That includes building our own party, running our own candidates, that will stand on our side and help us withstand the pressure from big business,” Spear said. But even as the push for an ordinance has been stalled at City Hall the movement still pushes forward. Still, folks have no delusions as to what they’re up against. Coming up on Oct. 15, the Fight for $15 will hold a massive, all-day event named the “Day of Action to End Poverty Wages in Minneapolis.” The event will be held at the Greater Friendship Missionary Baptist Church in South Minneapolis for canvassing, lunch, fellowship and collective strategizing around the Fight for $15. However, with powerful and courageous leaders like Blanca standing in the forefront of the movement, in many ways, the fight has already been won. Thanks for this article and for those organizations doing such a good job. Communities that know each other and work together are up to 400% more effective. We are seeing the fruits of long years of labor by activists of all stripe. And in case the Chamber is listening here, trust me, a living wage doesn’t mean poverty for the owners. Yes, it’s trickier, but many industries do it already. What it might mean for an owner is that you might just have a house with granite counters and one vacation a year, instead of several houses in luxury areas with cars and multiple vacations to match. That is really a small price to pay when others are having to choose between a phone and a car, or between medical care or food for the kids. For shame! What a fine piece of journalism about working-class empowerment and THE FIGHT FOR 15! I would strongly encourage you to send it to national outlets such as Common Dreams (www.commondreams.org), and Znet (zcomm.org). I’m sure that many others may run it as well. thanks for your kind words! this is such an important issue here right now in Minneapolis!